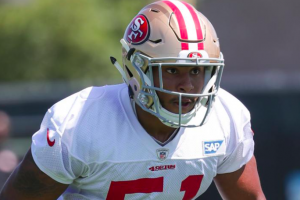 As if the San Francisco 49ers didn’t have enough challenges to tackle heading into the 2017 season, they now appear to have lost linebacker Malcolm Smith to a season-ending injury. An MRI taken Saturday revealed that Smith has a torn pectoral. Head coach Kyle Shanahan is holding out hope that Smith will be able to play this season. But it’s likely that the torn pectoral will cost Smith the entire 2017 season. Smith suffered the injury during Practice Saturday, as he appeared to get his arm caught in the helmet of running back Matt Breida. He attempted to continue practicing but was quickly ushered to the locker room. An MRI later confirmed the severity of the injury and the team’s fears that he could miss the entire season. Smith’s star has done nothing but rise since he was named MVP of Super Bowl XLVIII as a member of the Seattle Seahawks. He accumulated more than 100 tackles in each of the past two seasons with the Oakland Raiders. Smith was able to parlay that into a five-year, $26.5 million contract with the 49ers during the offseason. San Francisco made Smith one of its top free agent priorities during the offseason. The 49ers envisioned Smith starting at linebacker alongside NaVorro Bowman and Ahmad Brooks, giving San Francisco one of the best linebacker trios in the NFL. The 49ers are expected to lean heavily on the front-7 of their defense this season. Not having Smith would be a significant loss to the 49ers defensively. One-time safety Ray-Ray Armstrong took Smith’s place at outside linebacker after Smith’s injury. Based on experience, he’s the most likely candidate to step in at Smith’s position. Armstrong has spent the last two years with the 49ers, but has played in just seven games. Ironically, he missed most of 2016 with a pectoral injury. Another option to replace Smith is rookie Reuben Foster, who the 49ers grabbed at the end of the 1st round of this year’s draft. Defensive coordinator Robert Saleh has said the team doesn’t want to rush Foster into the starting lineup. However, the injury to Smith could change those plans, potentially giving the rookie an opportunity to win a starting job by the end of the preseason. With Foster being known during his days at Alabama as a great run stopper and Armstrong being strong in coverage as a former safety, it’s possible those two will split playing time once the season starts. Of course, the 49ers may prefer to pick one or the other to give the defense more continuity. If that’s the case, Armstrong may have a leg up right now, depending on how Foster performs during the course of the preseason. In any event, the loss of Smith, potentially for the entire season, is a huge blow for the 49ers this early in the season. San Francisco may be fine with some combination of Armstrong and Foster at outside linebacker. But the injury to Smith is still a big loss for the 49ers early in training camp.